There are a number of decisions that you can make in order to maximise the nutritional benefits of potatoes. The list below shows how to ensure potatoes remain a healthy choice. Cooking with the skin on Some nutrients, particularly phytonutrients, are present in much higher concentrations in or just below the skin, in addition, keeping the skin on can help prevent the loss of some nutrients during cooking. Avoid chopping potatoes Leave potatoes whole or cut into as large a piece as possible. Cutting potatoes into small pieces increases the number of cut surfaces that can be oxidised, and there are greater losses of nutrients due to leaching. Cooking methods Choose baking, steaming or microwaving as these methods don’t use water. This reduces the loss of nutrients by leaching into the cooking water. Reduce fat Bake as an alternative to frying. Use vegetable oils in place of fats which are solid at room temperature. When roasting potatoes leave the skin on, cook separately from meat and drizzle with oil, or use an oil spray. Alternatives to salt Use herbs, garlic, pepper in place of salt. To minimise the amount of sodium in the diet only use a small amount of salt when cooking potatoes. Choose small potatoes Small potatoes have more skin relative to flesh. They can be more easily cooked whole which helps retain nutritional components. Select coloured varieties These have high levels of phenolics and contain anthocyanins. They may also have higher concentrations of some other nutrients such as folate. Avoid green potatoes The green is an indicator that glyoalkaloids may be present. Glyoalkaloids are considered toxic and it is best to avoid consuming green potatoes. Potatoes are so versatile. Potatoes can be the hero in a dish on their own, or an integral part of a meal, or accompany other food for everyday meals and special occasions. There are a number of potato varieties to choose from at any time of the year – choose the right potato for its end use. Note that the right potato depends on growing conditions, weather and time of year. Detailed below are classic potato dishes. New potatoes have a delicate flavour and are usually available from the end of winter. They are young potatoes and unlike their fully grown counterparts, they keep their shape once cooked and cut. They are also sweeter because their sugar has not yet converted into starch, and are therefore particularly suited to salads. Choose new potatoes that are firm, dry and blemish-free. Unwashed potatoes last longer as the dirt protects them from bruising and general deterioration. You don’t need to peel new potatoes; just rinse to remove any dirt and cook whole. To boil, place potatoes into a pan of lightly salted water, bring to the boil, simmer until tender (about 10 minutes) and drain. Dress new potatoes as soon as they are cooked to help them absorb the flavour of the butter or oil (this way you will also use less). Store new potatoes in a cool, dark, well-ventilated place. They should be used within a few days of purchase. After years of consumer confusion about what a new potato is, and after extensive industry-wide consultation, Potatoes New Zealand has defined a new potato as ‘a young potato characterised by soft skin, so delicate it can be easily flicked off with your fingers’. If the skin cannot be flicked off, then the potato is not a new potato. Traditionally potatoes were peeled and parboiled before roasting to give a crunchy outside. However, the skin can be left on and the potatoes cooked a little longer. Select floury textured potatoes labelled roasting or baking* for best results. Cut into even sized pieces. Parboil potatoes in water for 8-10 minutes or until the outer layer of the potato is cooked (optional). Place a little oil in a pan and toss the potatoes to coat. Alternatively, use an oil spray to ensure even coating. Roast in preheated oven for 35-45 minutes, depending on the size the potato pieces are. Turn a couple of times during cooking. When golden brown, season and serve immediately. Country style chips: cut potatoes into thick slices. Criss-cross potatoes: cut in half then cut criss-cross patterns with a sharp knife in the cut surface. Brush with oil and bake cut side up. Hasselback: place a potato in the hollow of a large spoon and make vertical slices. The spoon will stop the potato being cut right through. Brush with oil. Zesty roast potatoes: potatoes roasted with lemon and thyme. Wedges: cut each potato into about 8 wedges. Leave the potato skin on because there is fibre in the skin. The larger the size of the potato pieces, the less oil they will absorb. Spray oil coats potatoes evenly and uses less oil. Use oil, rather than clarified butter or dripping. Use flavourings such as garlic, or fresh herbs such as rosemary or thyme instead of salt. There are many opinions on how to get the perfect mash, however, it comes down to personal preference. Cut potatoes into even sized pieces so they will cook at the same rate. Place in a saucepan with a lid and add enough cold water to just cover the potatoes. Place the lid on the saucepan, and bring to the boil. Once boiling, reduce heat and simmer gently. Vigorous boiling will cause most potatoes to break up. After about 20 minutes test if they are cooked with a skewer or sharp knife – they need to be really soft but not broken up. Do not test too early as it can cause the potato to break up. Drain well, and mash until all lumps are gone. Milk, butter, salt and pepper are the traditional ingredients added to mashed potatoes, however, more adventurous combinations can be used. Try olive oil, margarine, finely chopped herbs, grated cheese, plain yoghurt, whole grain mustard, sour cream, olives, capers, chopped sun dried tomatoes, horseradish, capsicum or sautéed onion. 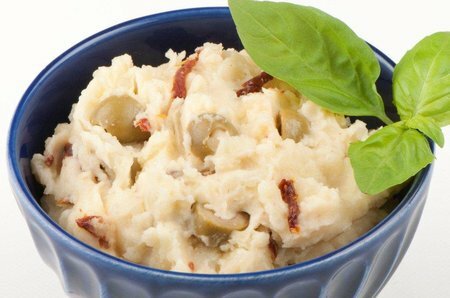 For very smooth creamy mash – use a potato ricer to push the potato flesh through small holes resulting in a fine texture. Then follow point 8 instructions. Add low fat milk and a splash of olive oil to the mash. Flavoured olive or avocado oils, fresh herbs and or sautéed onions can be used to add flavour instead of seasoning. ‘Smashed’ potatoes are unpeeled cooked potatoes which are mashed – potatoes retain more fibre when unpeeled. Select a waxy textured potato labelled for boiling or salads* if the potatoes need to hold their shape. Place into a saucepan with a lid. Add enough cold water to just cover the potatoes. Use boiling water with new potatoes. Season to taste. Place the lid on the saucepan and bring to the boil. Once they come to the boil reduce heat and simmer gently. Vigorous boiling will cause most potatoes to break up. Drain and toss in a little oil, butter or chopped fresh herbs. When making potato salads, for a better flavour, add the dressing to warm potatoes and allow enough time for flavours to be absorbed. When boiling, use as little water as possible. Vitamin C and B group vitamins are water soluble, which means some of them will dissolve into the cooking water. By using only a little water this loss is kept to a minimum. Keep the pieces large, and there will not be as much surface area for the vitamins to leach from. Select a waxy textured potato labelled for boiling or salads*. Steaming potatoes stops water soluble nutrients being lost as the potatoes are not covered in water. Steamed potatoes do not need to be seasoned. The potatoes do not break up as can happen with boiled potatoes. For best results use a potato labelled as baking*, however, almost any variety can be baked. Floury textured potatoes will have a fluffier texture when cooked and will absorb more fillings and flavours. A microwaved or baked potato in its skin contains more fibre than two slices of wholemeal bread, making it an excellent high fibre lunch ‘base’. Baking potatoes in the oven makes the skin go deliciously crunchy and the flesh very fluffy. To shorten baking time, partially cook the potatoes in the microwave and complete baking in the oven so the potatoes will develop a crunchy skin. As a guide: 4 potatoes microwaved on high power for 10 minutes will need 10-15 minutes in the oven at 200°C. Pierce potato skin in 2-3 places. Place potatoes in preheated oven and bake for about an hour (dependent on size). Potatoes are cooked when soft to touch. Once cooked, remove from the oven. Hold potato in an oven cloth and cut a cross in the top. Squeeze the base to push the flesh out. This lets the steam escape. Top with filling of choice. Alternatively, cut in half, carefully scoop the flesh out of the skin taking care not to break the skin. Mash the flesh and add desired fillings. Pile the mash back into the potato skins and return to the oven until the tops are golden. Filled potatoes can be pre-made and baked when needed. Cooking potatoes in the microwave is fast but the potatoes will not develop a crunchy skin as happens in the oven. Microwaving is ideal when cooking for one or two people. Pierce each potato several times with a sharp knife. Place potatoes around the edge of the microwave tray. Depending on the microwave’s power allow 3-4 minutes on high power for each potato. E.g. two potatoes will take 6-8 minutes, three will take 9-12 minutes. Choose low fat toppings such as lite cream cheese and lite sour cream. Top with baked beans, chilli sauce, tuna or salsa. Serve with a salad. The best homemade wedges and chips are made from floury textured potatoes – these potatoes will be labelled as baking or roasting*. Scrub potatoes, but preferably do not peel. Cut each potato into about 8 wedges. If making chips, cut potatoes into chip shapes. Place 1-2 tsp oil in a bowl. Add potato pieces and toss to coat. Alternatively, spray with oil so the potatoes are lightly coated. Place on a non-stick oven tray. Bake, uncovered, in a preheated oven for 20-30 minutes or until golden brown and crunchy. Turn at least once during cooking. The chunkier the chip or wedge, the healthier they will be because there will be less surface area to absorb oil. Leave the skin on to retain nutrients, especially fibre.